A delicious quick and easy Lamb Keema recipe. This minced lamb curry is perfect for midweek meals. 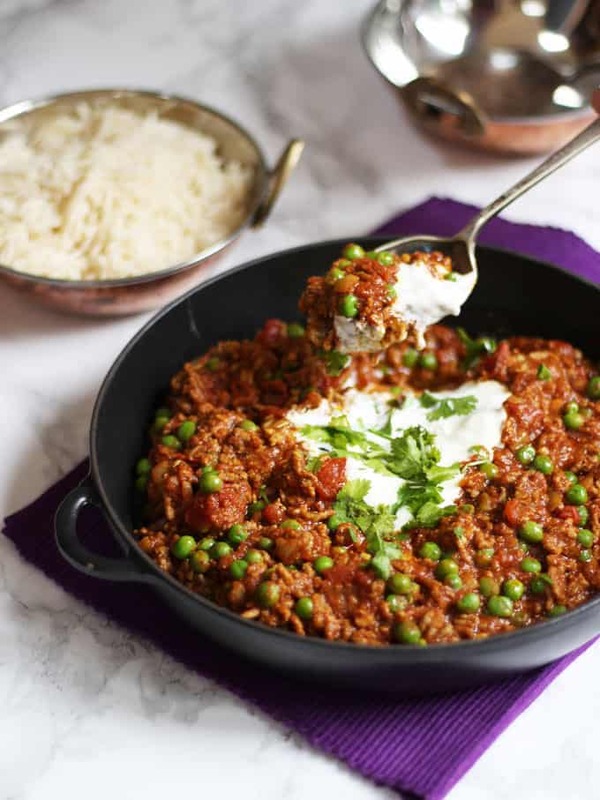 This recipe for keema is one of the tastiest and easiest lamb mince recipes you will ever make. This family curry recipe also freezes well and is adaptable to use beef mince. Life is just so hectic! The juggle of work, school, after school activities, playdates (!) and trying to maintain some social life or me time, is a challenge. This has led me to try and become more organised through meal planning. One meal we’ve enjoyed was this Lamb Keema recipe using lamb mince. Why is it so good? TIME: It is on the table in around 30 minutes – What is more, most of that thirty minutes it is bubbling away on its own so plenty of time for you to do homework, lathe table, read a book, whatever you like! It is the perfect BATCH COOK dish. I have to restrain myself from putting it on my meal plan each week as it is such a good recipe to make double of, and it freezes really well. All cooked in ONE PAN – minimum washing up! Need I say anymore? Keema is a basically a minced lamb curry, this one uses lamb mince but it can also use other types of minced meat. It’s a favourite meal here, so quick, easy and economical, a perfect midweek curry. Of all of the lamb mince recipes in my go to pile, this is our favourite. I know I told you how I was feeling all the feels about school but then, the big moment came and off they went. G said “have a fun day Mummy” as he turned away without so much as a backwards glace. OMG. Will I ever find out what they’ve actually been up to? They tell me nothing. Did they really have ‘edges’ for lunch? They insisted that’s what was on the menu. Whaaaa’? Do they get replaced at home time by ravenous, fridge raiding monsters? They are SO hungry, I’ve never known anything like it. The answers I got there made me laugh a lot, it turned out I’m definitely not alone. There’s lots of ravenous kids out there after school. I hope this recipe helps you to tame yours too! 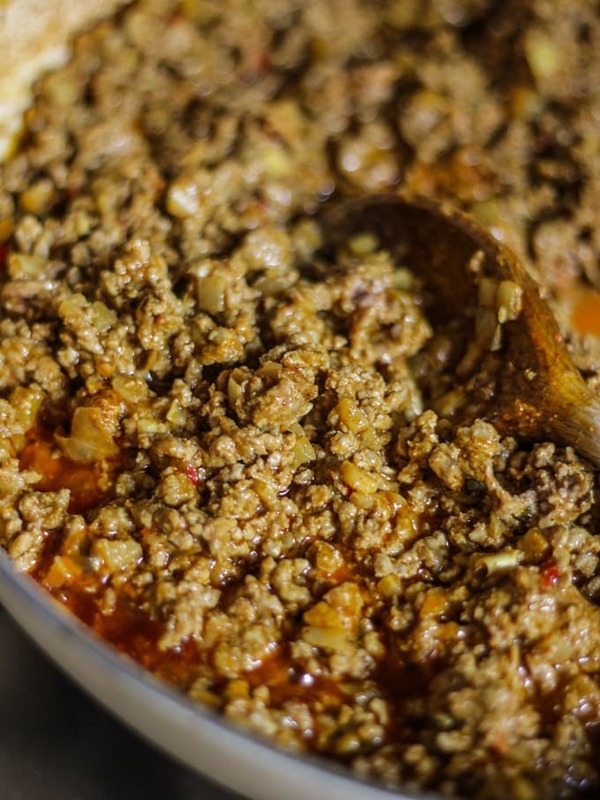 How do you make a Keema Curry? To make this minced lamb recipe, you brown off your lamb mince in a pan and set aside. Then add your onions, garlic, ginger, chilli and curry paste and let them cook down. Add back in your mince, then your tinned tomatoes, sugar and tomato puree. Let it all bubble away, add the peas to cook through and serve. Delicious! 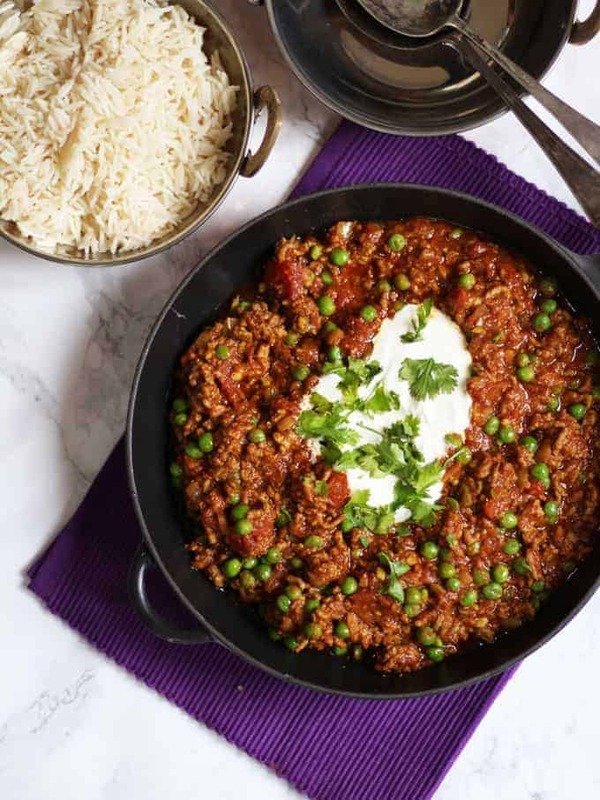 This recipe is also easy to adapt if you’re following the Slimming World plan, just omit the oil, replace the mince for very lean lamb mince (and count any ‘syns’) and replace the curry paste with curry powder. What to serve with the Keema recipe? Rice: I tend to serve this with basmati rice (or brown rice if we’re feeling healthy). TIME SAVING TIP: Use microwave rice – 90 seconds and ready. It is especially good when you only need a small amount. Naan breads or chapatis – or if you have more time my Easy Flatbreads. I also really like to make a simple raita (yoghurt sauce) using yoghurt, mixed with fresh mint or mint sauce. Butternut Squash Curry – perfect for MEAT FREE MONDAY! I hope you enjoy this recipe as much as we do. 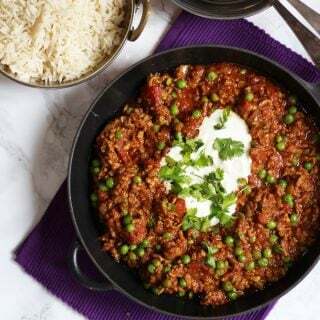 I’d love to know how you got on and what you thought of it if you make this Lamb Keema Curry recipe. Please rate the recipe and leave me a comment below if you do. 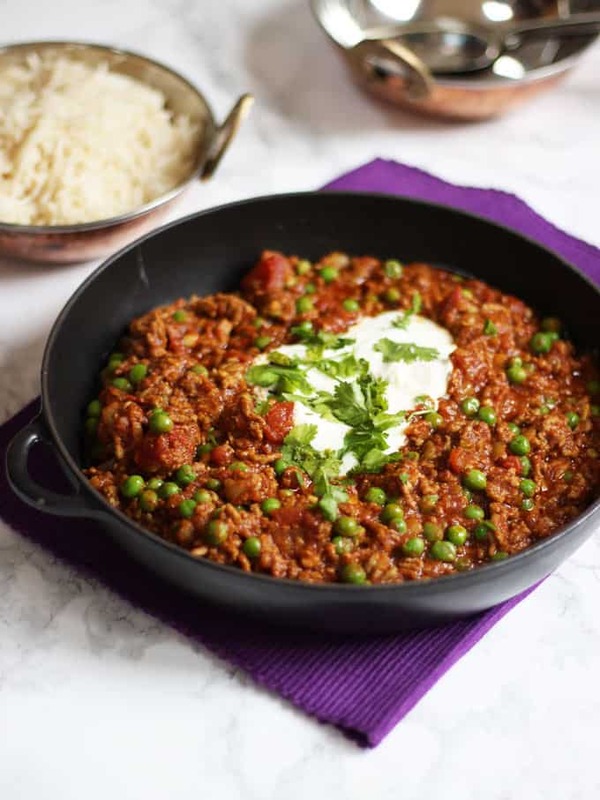 A delicious, quick and easy, family friendly Lamb Keema curry recipe. Perfect for a midweek dinner, on the table quickly. Here's how to make one of the tastiest and easiest curry recipes. 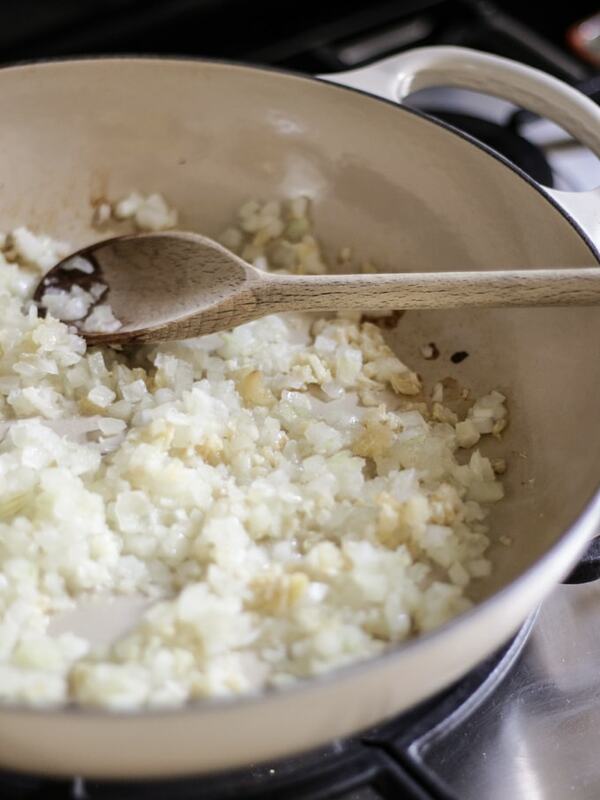 Heat the oil in a large non-stick frying pan and cook the onion and garlic over a low heat for 10 minutes or until soft and lightly golden. Add the ginger, hot chilli sauce or fresh chillies and curry paste. Cook over a moderate heat for 1-2 minutes, stirring occasionally. Add the lamb and stir-fry for 2-3 minutes, then add the tomatoes, sugar, tomato purée and bring to the boil. Season, reduce the heat and cook uncovered for 20-25 minutes, stirring occasionally. Add a little water, if needed. During the last 5 minutes add the peas. Remove from the heat and stir through the herbs. Use as required or cool quickly, transfer into plastic container and freeze for up to 3 months. Ahh! I know this! I just sent my littlest to school this September and although I have done it before with my eldest, it didn’t make it any easier <3 And overnight he went from picking at dinner to eating every last mouthful. 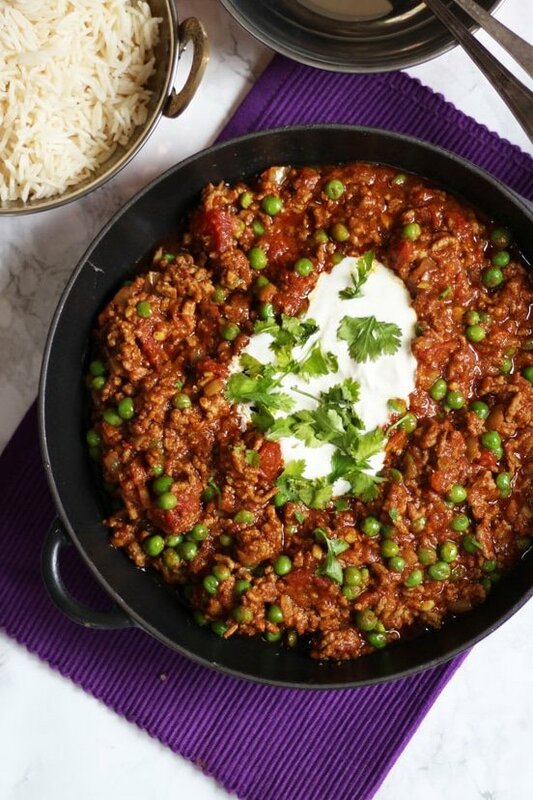 This recipe looks great, we love curry but I have never made keema before so will have to give it a go! Oh yum, I love Kellie’s blog! This looks really scrummy 🙂 I remember when I was at school (back in the day!) I would always come home from school feeling so hungry! I probably drove my Mum mad raiding the fridge every afternoon! This is a staple in our house now. I’m cooking it at the minute, double batch to freeze half. My husband thinks I’m amazing when I serve it ion we love it with some fresh salad, naan and rice. My Indian friend gave me a tip: to wash the lamb mince before cooking. It is absolutely stomach churning but worth it. It makes the mince so fine and wonderfully crumbly. Just put it in a sieve, rinse it with warm water and break it up with your hands. It goes grey and resembles brains but it makes the difference!! So pleased you love this recipe Jan and thanks so much for the tip! I will add it to the post to help others if that’s okay? Thank you again! Lovely! One of my faves. I loved making this for guests and they loved eating it. So I now make it in batches. Its a real pleaser. Comfort eating at its best. Don’t forget the mango chutney! Tried this for the first time today. It went down a treat with everyone. Especially my 18 month old son.